Russian financier and philanthropist; born 1812; died at Paris Jan. 12, 1878. Having acquired great wealth during the Crimean war, Günzburg established a banking firm at St. Petersburg. There he began to labor on behalf of the welfare of the Jewish community. 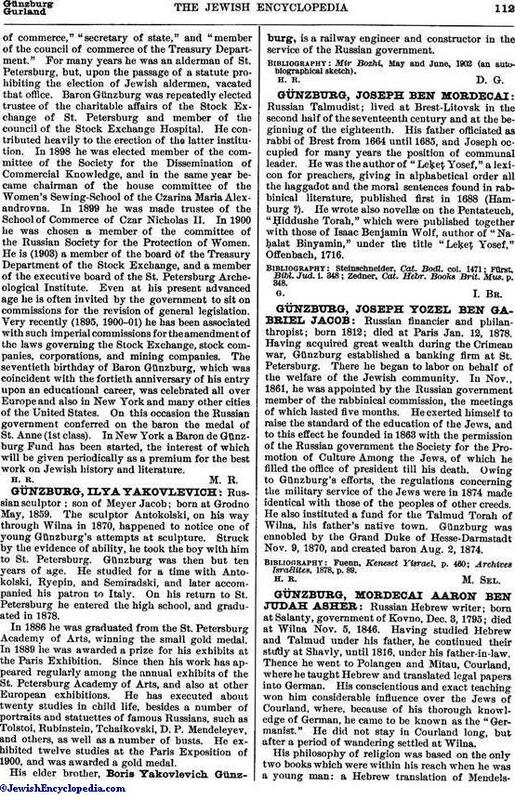 In Nov., 1861, he was appointed by the Russian government member of the rabbinical commission, the meetings of which lasted five months. He exerted himself to raise the standard of the education of the Jews, and to this effect he founded in 1863 with the permission of the Russian government the Society for the Promotion of Culture Among the Jews, of which he filled the office of president till his death. Owing to Günzburg's efforts, the regulations concerning the military service of the Jews were in 1874 made identical with those of the peoples of other creeds. He also instituted a fund for the Talmud Torah of Wilna, his father's native town. Günzburg was ennobled by the Grand Duke of Hesse-Darmstadt Nov. 9, 1870, and created baron Aug. 2, 1874. Archives Israélites, 1878, p. 89.